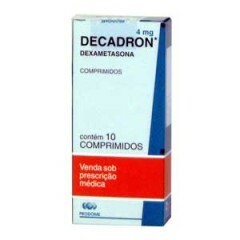 Decadron is the common trade name for the potent glucocorticoid steroid Dexamethasone. The drug is also marketed as the brand names Hexadrol, Baycadron and Cortastat, and available in the form of oral tablets, an injection for intravenous or intramuscular use or ophthalmic eye drops. The function of Decadron in the body is to act as a potent anti-inflammatory or immunosuppressant, with a potency of more than 26 times that of the body’s natural corticosteroid hormone cortisol (the stress hormone). Although the broad use of this drug is to mediate anti-inflammatory and immunosuppressive effects, the versatility of this drug is nearly unrivalled. It is used to alleviate disorders of a wide multitude that afflict various body systems.